Since Nicola and I are running our third Warrior Dash together tomorrow I thought it would be a good time to recap last year’s race. 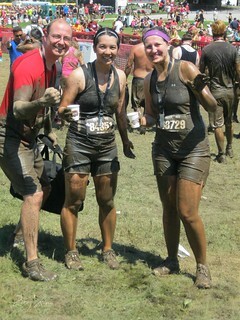 After running Warrior Dash in 2012, Nicola and I returned for more mud, fire and hills. 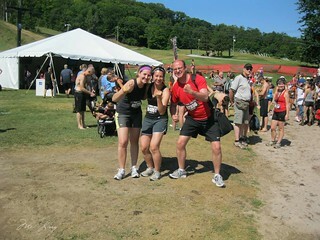 Nicola, Dan and I ready for Warrior Dash! This time Dan decided to run it too while Connie returned to cheer us on and carry our bags. As we waited to start things looked pretty dire. Nicola had injured her foot and I had strained my quad. It was ok to run on but I worried about the obstacles and as we headed to the line up Connie and Dan laughed at us limping along. While we waited we saw somebody propose at the mud hill and everybody clapped. I took off my wedding ring and left it with Connie, since I was scared of losing it in the mud. Dan’s wedding ring is very loose on his finger (he’s already had it sized down once but lost more weight since then). I turned to Dan and said “Maybe you should leave your wedding ring with Connie.” And he said “It’ll be ok. I’ll put it in my pocket if I have to.” Famous last words. I told Dan to go ahead without us since we were probably going to walk most of the race. To complicate matters, I was flying out to Ireland that night and worried that I’d break something and wouldn’t be able to go. We probably shouldn’t have been running it, with our injuries and my Ireland trip, but we decided to take it easy (spoiler alert, everybody made out alive and without breaking anything). Soon we were off and running. Dan starting the race. Nicola and I were already behind. I just stood there calmly. I figured there was no point getting mad if he was already very upset, especially if getting angry wasn’t going to accomplish anything. Besides, he already said three of the greatest words ever uttered, “You were right.” As I tried not to smile smugly people nearby had heard and started looking out for it as well. Nicola and I went down the slides and started searching around the area. The woman who went down the slide after Nicola said “Is this the wedding ring?” She had somehow found it in the mud and water. I have no idea how. It was like a small miracle. Dan was so happy he ran over and hugged her. She was an older woman who was running with her husband. This is another reason why I love races. The running community is amazing and strangers always seem willing to help each other out. After that, Dan zipped his wedding ring safely into his pocket and took off. There was one obstacle that Nicola and I ended up skipping. You had to climb over a wall and down the other side. Nicola went first and as I was partway up the wall she came back around and said “Don’t go up Mei! The other side is hard to climb down. I ended up falling.” So I ended up climbing back down. One of my favourite obstacles had water shooting up around you as you climbed up a wall. On the other side there was a two by four across the middle so I climbed onto that and opted to climb down with my front to the wall. As I tried to climb down I slipped and slid down the wall on my front screaming the whole way and landing face first in the mud. It was hilarious. Afterwards I realized that most people were climbing down the other way. Since I fell on the fire jump last year I was too chicken to attempt it again. With my strained quad and my flight to Ireland later that night, there was too much at risk. Instead of taking the leap I ran around all of the fire pits. It was worth it. When we crawled through the mud under barbed wire I chose the right side because it looked like there were a lot less people. I soon found out why. There was a man with a fire hose at the end of the mud pit and the hose hit me over and over and over again as I crawled through the mud. I felt my contact lens move around in my eye but it stayed in. Finally we reached the end and ran triumphantly to the finish. Nicola and I climbing over the mud hill after the mud crawl. 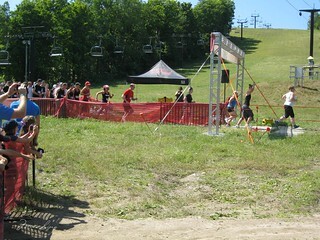 Nicola and I finishing the race. 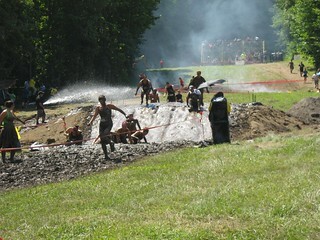 Another change to Warrior Dash was the lack of firefighters. Last year we were hosed off by firefighters. 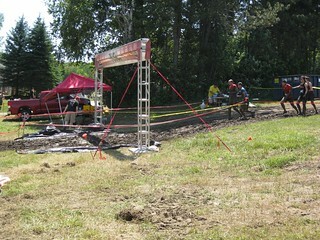 This year, they had a water station where you hosed yourself off. It was a lot less fun and took much longer, but was probably a better use of resources. 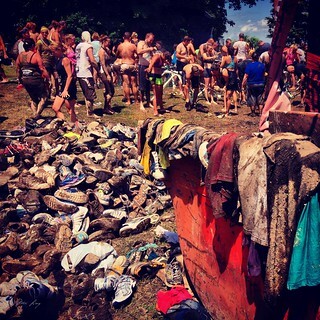 Muddy shoes and clothes. I believe they get donated. 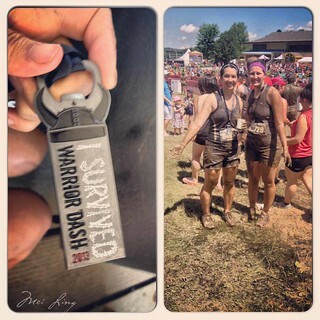 So that was how we ‘ran’ Warrior Dash 2013. Dan has decided that obstacle races aren’t for him, not only because of the wedding ring incident (and yes the wedding ring did make it home safe and sound), but because he’s more of a running purist. A close up of my medal (it’s also a bottle opener) and Nicola and I at the finish. Nicola and I on the other hand are signed up for 2014. 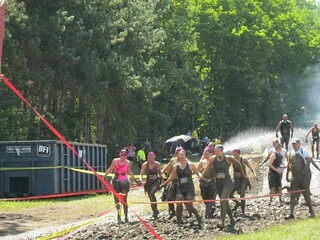 It’s always an interesting time at Warrior Dash, so we’ll see what happens this year!